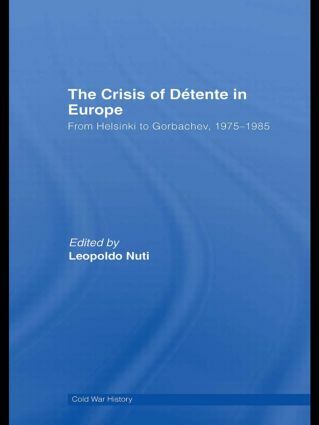 This edited volume is the first detailed exploration of the last phase of the Cold War, taking a critical look at the crisis of détente in Europe in the late 1970s and early 1980s. The transition from détente to a new phase of harsh confrontation and severe crises is an interesting, indeed crucial, phase of the evolution of the international system. This book makes use of previously unreleased archival materials, moving beyond existing interpretations of this period by challenging the traditional bipolar paradigm that focuses mostly on the role of the superpowers in the transformation of the international system. The essays here emphasize the combination and the interplay of a large number of variables- political, ideological, economic and military - and explore the topic from a truly international perspective. Issues covered include human rights, the Euromissiles, the CSCE (Commission on Security and Cooperation in Europe), the Revolution in Military Affairs, economic growth and its consequences. Leopoldo Nuti is Professor of History of International Relations at the University of Roma Tre.